We are an adventure travel company with fundraising at our heart. Made up of people who love the outdoors, our mission is to create adventure challenges that enable people to achieve their ambitions - be that getting fit, pushing their boundaries or doing something incredible to enable them to change the lives of others through fundraising. Pre Discover Adventure: After failing most of my A Levels my parents dropped me at Portsmouth Harbour (a quick caveat - they didn't abandon me in disappointment, I asked them to!) and from there I began hitchhiking. First through France, then Spain, Morocco, Algeria and Tunisia. I almost ran out of money but luckily found a yacht looking for crew to sail to Australia (as you do). This lead to an amazing 5 month trip via the Red Sea and Indian Ocean. I then worked and travelled around Australia and South East Asia before arriving home 18 months later to take a course in Cartography. Present day: I'm proud to say that we still work with Macmillan today. 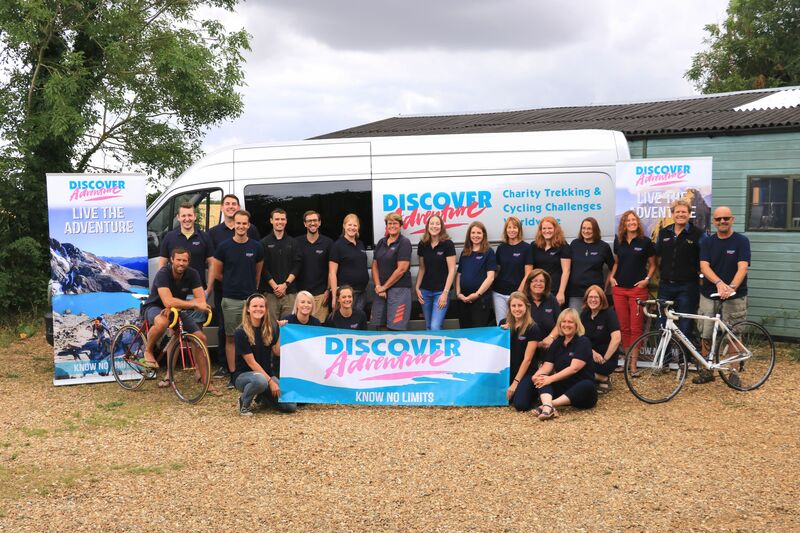 Discover Adventure has enabled many thousands of people to complete adventures of a lifetime and to raise well over £85million for the causes they care about. We've never looked back! I'm inspired by: new adventures, new places and meeting new people. Our planet is incredible - it's changing landscapes and diverse people are a constant source of inspiration. Discover Adventure is unique because: of our people and our purpose, but most importantly, our clients. They all have a reason, a personal story, behind why they want to push themselves out of their comfort zone and achieve their goal - be it by climbing Kilimanjaro or cycling 300miles through Europe. We also actively support projects in some of the countries we visit, you can find out more about our work in Nepal, Tanzania and Peru here. My next adventure is: well, I have recently sailed a 52 year old wooden boat across the Atlantic with a few friends who I spent time with at school (some older than the boat!) which was an incredible adventure! It's also an exciting time for DA as we're in the process of designing a new office for our expanding team so watch this space the next time you come to visit us! We know that the Discover Adventure crew plays a large part in making your trip enjoyable. Our leaders are all professional, friendly and experienced at running challenging trips all over the world, as well as being trained in first aid, mechanics, haggling, cocktail making and bad joke-telling to a high standard. Combined with the flexible, friendly approach of the office crew, it all adds up to making your trip a success. Our office crew are chosen for their organisational skills, travel experience and the pre-requisite sense of humour. There’s a huge amount that goes on in the background at Discover Adventure to ensure that your trip runs smoothly from start to finish. We work hard to organise your trips and look after everything, including ground operations, flights, crew training, admin and marketing between us. We have grown and adapted in many ways since we started running trekking and cycling trips in 1994, but our core values have not changed. We firmly believe that getting these right enables us to provide you with the best challenge experiences. FRIENDLY - It's a cliche, but we do care. We want you to achieve your goal and raise funds for your charity on the way. We will answer all your questions and literally hold your hand through the toughest parts if you need it. But this is also supposed to be the time of your life! From the bad jokes and great banter of our crew, to the camaraderie of your fellow challengers, we'll make you laugh when you feel like crying, and keep you going when you feel like stopping. EXPERTISE - From initial trip planning to the experienced leaders and medics accompanying you, our trips are backed up by 25 years of knowledge and experience. From what to pack, to getting your tired legs through the day, you can count on us. Safety is our top priority, and our long-standing relationships with people all over the world help to deliver safe, quality experiences. TRUST - You can trust us to provide a trip of a lifetime, not to compromise on safety, and to work closely and responsibly with local people. We pride ourselves on our honest, transparent ethos and the loyalty we have earned from the people who come back to us time and time again - customers and crew! PASSIONATE -We love what we do, and hope that it shows! We have a collective passion for trekking, cycling and the great outdoors in general. We want to sleep out under the stars and watch the sun rise over the mountains. We want to chat around a campfire after a hard day on our feet. We want to discover new cultures, see new sights and meet new people. We want to see what else we can learn and experience in this wonderful world. And there is no better buzz than helping you to do that too. CHALLENGING - We design our trips to be challenges, not holidays. They offer extraordinary goals for ordinary people, and the sense of personal achievement can be life-changing. That means we provide the support to match. A hardworking team of dedicated professionals have your back from the moment you enquire. We ask for determination and total commitment from you, and nothing less of ourselves. Leanne and Sarah climbing Kilimanjaro!